Begin your morning at Union Station in Downtown Denver where your driver and guide for the day will pick you up in a clean, comfortable passenger touring van. Then, the tour heads west to majestic Red Rocks Park and Amphitheater where you can walk into the amphitheater where many music legends have performed among the enormous rock monoliths. While in the park it is possible to tour the Visitor Center and learn more about the fascinating geology and history of this park and visit the Trading Post and enjoy the Colorado Music Hall of Fame as well as spectacular views. Later travel through the rugged Clear Creek Canyon and admire the towering rock walls and look for wildlife and rock climbers. Travelers will cross the Continental Divide while reaching an altitude of nearly 12,000 feet (3,657m). 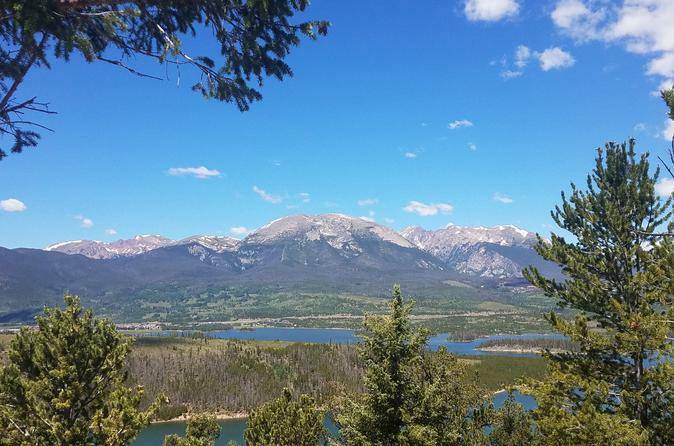 Next you can take a short stroll on a scenic trail and enjoy breathtaking views of the Ten Mile Mountain Range, ski resorts and Lake Dillon reservoir. The tour then goes to the historic mining Town of Breckenridge where travelers can stroll along the river-walk and the quaint streets shopping, or having lunch in one of the many restaurants or cafes (at their own expense). Or they may choose to ride a gondola up to the base of Breckenridge ski area (only available during ski season and summer weather permiting). Return to Denver passing through the Eisenhower Tunnel the longest and highest passenger car tunnel in the world. Arrival at Union Station will be around 4:30 pm.